5,000 of the beneficiaries live in the U.S. 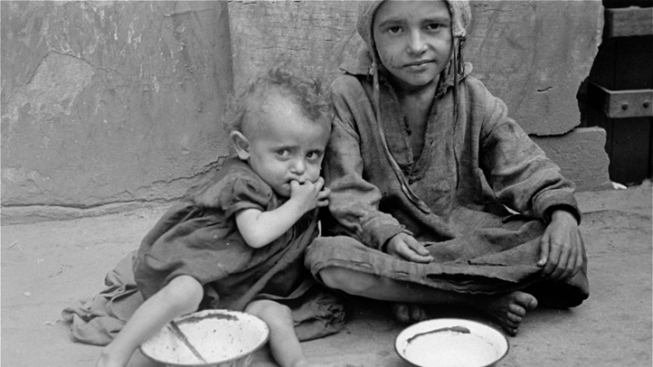 This 1941 photo provided by the United States Holocaust Memorial Museum, shows two destitute children sitting with empty bowls on a street in the Warsaw ghetto. Germany has agreed to pay pensions to about 16,000 Holocaust victims worldwide who survived wartime ghettos or were forced to hide from Nazi persecution. However, part of the new agreement does not immediately cover survivors who were young Jewish children born in 1938 or later. After a year of tough negotiations, Germany has agreed to pay pensions to about 16,000 additional Holocaust victims worldwide — mostly survivors who were once starving children in Nazi ghettos, or were forced to live in hiding for fear of death.